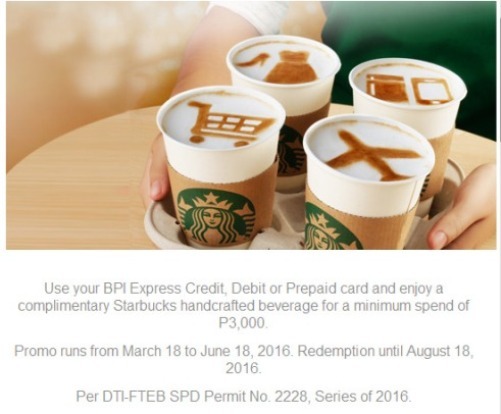 Interested to know the latest BPI credit card promo? I'm a BPI credit card holder for more than 4 years now, particularly the Sky Miles mastercard and today, I'm scouring the internet to find online perks, freebies and promos for different credit cards in the Philippines and Bank of the Philippine Islands is my first priority website destination. For OFWs looking to get and apply for a BPI credit card, please visit our guide tips on how to get an OFW credit card. Below is a list of the previous promos that Bank of the Philippine Islands have given to their loyal credit card holders in the Philippines. While past promos have been listed with pictures and mechanics on how to avail your shop anywhere promo free items, we will be enlisting as well the latest yearly promo offers by the bank. See mechanics and how to get your freebies below. Summer is almost to an end and the rain has just started pouring down a couple of days ago and it's just May 2. This could be a signal that the school day is getting nearer as well as enrollment time. For this particular reason, I am on the lookout already if there are mid-year bonus perks for my BPI credit card so I can avail them and know the mechanics as early as I could. I want to be first on the line to get the most out of having this card maintained for years without failure to get any bills unpaid. I deserve a treat and although I would mostly love it if a travel promo is available, I found out today via email subscription that Bank of Philippine Islands (BPI), the provider of my silver Sky Miles credit card has just released their latest card promo for March 2014-May2014. Mechanics on how to qualify and how to avail the perks are listed below as per DTI NCR permit for promotions under BPI rights. shop anywhere for minimum single receipts of P2,000, P6,000 or P12,000 from March 28 to May 31, 2014". Promo period is from March 28 to May 31, 2014. To qualify, cardholder should use any of the QUALIFIED BPI Express Credit card within the promo period for a minimum single purchase transaction of P2,000, P6,000, or P12,000 at any merchant. Transaction should be approved through a Point-of-Sale terminal. Cash advance transactions are also qualified. 1. Visit any Greenwich branch nationwide. 2. Present your BPI Express Credit Classic and MasterCard used for the transaction. 3. Surrender your qualified original charge slip or cash advance slip (minimum single receipt purchase of P2,000, P6,000 or P12,000). FREE Dole Pineapple-Mango Fruit Crisp - "For a minimum spend of P1,500 at participating Robinsons Supermarkets until May 31, 2014". 1. The promo is open exclusively to all existing BPI Express Credit (Classic*, Blue MasterCard, Gold MasterCard, BPI-WorldPerks MasterCard, BPI-SkyMiles MasterCard, Petron-BPI MasterCard, Edge MasterCard, BPI-Amore Visa, BPI-Amore Visa Platinum and Corporate Classic and MasterCard) and BPI Family Credit cardholders of good credit standing. 2. Promo period is from April 10 – May 31, 2014.
iii. Name and Card number printed on the charge slip must be the same as the one reflected on the card presented. 5. Charge slip will be stamped “CLAIMED” by the redemption personnel upon release of the free item/s. 6. A single purchase transaction requires only one approval. Splitting into smaller transaction size and consequently, requiring multiple transaction approvals will not be allowed. 7. BPI, Dole Philippines Inc. and Robinsons Supermarket shall not be responsible for the replacement and/or acknowledgement of charge slips/transaction receipts that are stolen, lost and/or faded for purposes of redemption. 8. Redemption personnel will request the cardholder to fully fill-out the redemption tracking sheet provided. 9. The free item/s cannot be exchanged for cash, other products, or discounts. 10. 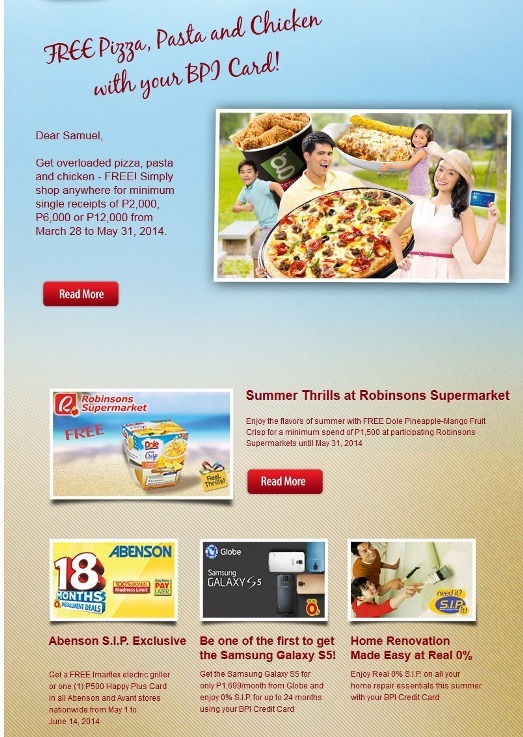 The promo is not valid in conjunction with any other ongoing promo at Robinsons Supermarket. 11. Redemption is until July 31, 2014. 1. This promo is open to existing BPI Credit Card (Classic, Blue MasterCard, Gold MasterCard, Petron-BPI MasterCard, BPI Edge MasterCard, BPI SkyMiles MasterCard, BPI-WorldPerks MasterCard, BPI Amore Visa BPI Amore Visa Platinum and BPI Family Credit Card) cardholders of good credit standing. 2. Promo period is from May 1 to June 14, 2014. 3. Cardholder should avail of Special Installment Plan (S.I.P.) using his BPI Credit Credit card within the promo period at any Abenson or Avant store nationwide. 4. BPI Credit Card’s Real 0% interest and reduced rates on S.I.P. are available on select items at select terms for a minimum purchase of P3,000. Real 0% on 18-month installment term is available for a minimum single-receipt purchase of P9,000. 5. BNPL is applicable on all S.I.P. transactions. Cardholder should advise cashier/store personnel if he will avail of Regular 0% installment. Otherwise, the BNPL scheme will be applied. 6. The approved installment transaction is automatically deducted from the cardholder’s available credit limit. 7. The posting of Buy Now, Pay Later (BNPL) first amortization will start 60 days from the date of purchase. The succeeding amortization shall be billed every month thereafter, until the full transaction is paid in full. 8. If a cardholder decides to pre-terminate his (S.I.P.) transaction prior to the first billing, BPI Credit Card will charge a pre-termination fee of P550 plus an additional 2% interest on the principal amount. If the pre-termination is done after the 1st billing, monthly payment shall first be applied to the interest then to the principal using the diminishing balance method plus a pre-termination fee of P550. 9. The terms and conditions governing the issuance of the BPI Credit Card and the reminders and other provisions contained in the card carrier, statement of account, charge slips and other documents or instruments, which are made an integral part hereof by reference, shall likewise be resorted to in instances where they are applicable in this offer. 2. To redeem, cardholder must present for verification the original BPI charge slip / Installment Plan Contract and the BPI Credit Card used at the Abenson or Avant customer service representative in the store where the transaction was made. 3. Charge slip will be stamped “CLAIMED” by the customer service representative upon release of the free item. 4. A single purchase transaction requires only one approval. Splitting into smaller transaction sizes and consequently requiring multiple transaction approvals will not be allowed. 5. A cardholder may avail a maximum of one (1) free item per branch per day. Items are subject to availability per branch. 6. The promo is not valid in conjunction with any other ongoing promo at Abenson or Avant, unless otherwise indicated. 7. Redemption is valid until August 30, 2014. Get the Samsung Galaxy S5 - For only P1,699/month from Globe and enjoy 0% S.I.P. for up to 24 months using your BPI Credit Card. 1. This promo is open to existing BPI Express Credit cardholders BPI Express Credit Card (Classic, Blue MasterCard, Gold MasterCard, Petron-BPI MasterCard, BPI Worldperks MasterCard, BPI Skymiles MasterCard, BPI SkyMiles Platinum MasterCard, Edge MasterCard, BPI Amore Visa Card and BPI Amore Visa Platinum) and BPI Family Bank Credit cardholders of good credit standing. Cardholder should subscribe to any Globe Postpaid Plan to get a Samsung S5 and avail of the Special Installment Plan (S.I.P.) up to 24-month term for the cash-out amount at any Globe store nationwide. Visit http://www.globe.com.ph/galaxys5 for details. 3. BPI Express Credit’s Real 0% interest and reduced rates on S.I.P. are available on selected items at selected terms for a minimum purchase of P3,000. All transactions are subject to BPI Authorizations approval. 4. The approved installment transaction is automatically deducted from the cardholder’s available regular credit limit. 5. If a cardholder decides to pre-terminate his (S.I.P.) transaction prior to the first billing, BPI Express Credit will charge a pre-termination fee of P550 plus an additional 2% interest on the principal amount. If the pre-termination is done after the 1st billing, monthly payment shall first be applied to the interest then to the principal using the diminishing balance method plus a pre-termination fee of P550. 6. The terms and conditions governing the issuance of the BPI Express Credit and the reminders and other provisions contained in the card carrier, statement of account, charge slips and other documents or instruments, which are made an integral part hereof by reference, shall likewise be resorted to in instances where they are applicable in this offer. Enjoy Real 0% S.I.P. on all your home repair essentials this summer with your BPI Credit Card. 1. Real 0% facility is open to existing BPI Express Credit (Classic, Blue MasterCard, Gold MasterCard, Petron-BPI MasterCard, BPI Edge MasterCard, BPI SkyMiles MasterCard ,BPI-WorldPerks MasterCard, BPI Amore Visa Classic and BPI Amore Visa Platinum) and BPI Family Credit Card cardholders of good credit standing.